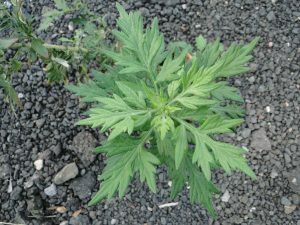 Connecticut plant scientists and volunteers who work on invasive issues are gravely concerned that mugwort (Artemisia vulgaris) is spreading rapidly throughout our road network. Minute seeds are blown across the winter landscape and carried in road dirt, in tire treads, on undercarriages, and by snow plows. The seeds germinate well in bare spots, and new mugwort patches spread from roadsides into adjacent meadow and forested habitats. A two- meter-tall plant yields up to 200,000 seeds! We urge a time-sensitive measure: please mow the mugwort on your own land and encourage roadside mugwort mowing on municipal, DOT, utility, & commercial land preferably before a hard frost, when the tiny seeds start to fly. Weed-whack mugwort plumes behind guard rails. If the mugwort is past bloom but still not brown and crisp from frost, the cuttings can be moved and piled up, then covered with mugwort-free hay mulch or brush, or bagged for disposal, without risk of dispersing the seeds during the initial moving process. However, a new patch is likely to form at the disposal pile. In a large existing patch, it is best to leave the cuttings in place. Mugwort was repeatedly transported from Europe to New England several centuries ago in ship ballast. Ignored for centuries. as a tough, clonal weed of vacant land, it has begun to spread by seed, as well as by rhizome bits – found even in screened commercial topsoil. 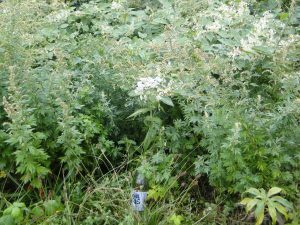 Each established patch has a large network of vigorous rhizomes (underground stems), like Japanese knotweed, also shown in bloom in the background of photo at left, which depicts a stand of mugwort in bloom, relatively low because it was mowed in early summer. Note that most Japanese knotwood clones have non-viable seeds, but seed germination has been detected in a few studies, an urgent research need, as Japanese Knotweed is, like mugwort, a “supercompetitor”. Mugwort grows in sun or shade, and in droughty or soggy soil. Dense mugwort colonies crowd out even the hardiest native goldenrods, grasses, and asters, but mugwort has far less ecological value. The seeds are too small for birds to eat. In September, mugwort plants form plumes with tiny, dull white flowers which yield no nectar, though the abundant wind- dispersed pollen causes hay fever. The finely dissected, gray-green leaves have a strong medicinal smell, and are eaten by few herbivores; because it repels fleas and vermin, mugwort has been used as bedding for livestock. Mugwort often reaches over 4.5 feet in height, though early summer mowing, shade, or very infertile soil may reduce its mature height to 1-2 feet. Artemisia vulgaris threatens Connecticut’s biodiversity, agriculture, public health, and natural scenery. Simple mowing can much slow down its advance. Other control measures include double layers of landscape fabric or other mulch. Treatment with herbicides is very challenging, due to the deep, dense rhizomes. Unfortunately, mugwort has begun to colonize some of Connecticut’s most special, beautiful places where uncommon and rare plants can still be found, such as rocky summits, sand plains, and river floodplains, termed “Critical Habitats” by the Wildlife Division of the Connecticut Department of Environmental Protection (CTDEEP). On a CBS botany field trip in North Haven, last summer, we noticed that mugwort is now abundant in the beautiful pin oak forest east of the Quinnipiac Marsh and in a silver maple floodplain forest along the Still River, in a Weantinoge Land Trust preserve in New Milford. In a botanically diverse state park or preserve, careful pulling of young plants may prevent establishment of new colonies, but only if done before formation of rhizomes (underground stems). Research is needed to find out at what stage this takes place, and also how long rhizome fragments remain viable. Snow plows & street sweepers likely disperse seed & rhizome bits. Would additional mowing during the summer be helpful? This photo of a mugwort seeedling (or rhizome sprout) was taken in about 2015 at the edge of a gravel tracking pad in Meriden, at the Platt High School construction site (where I was an erosion & sediment control monitor). Nearby, I noticed that along the Sodom Brook linear trail the city practice of trailside mowing in early summer was allowing mugwort to coexist with native goldenrods and small white asters, over a two-year period – but for how long? Frequent mowing will help control a mugwort colony, but will result in a mugwort-dominated lawn, NOT a scenic meadow, with perennial grasses & flowers like chickory, goldenrods, Joe Pye, ox-eye daisies, asters, and Vernonia. 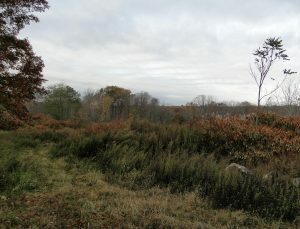 Members of the Right-of-Way Sub-committee of the CBS Ecology & Conservation Committee are concerned that Eversource’s new wide gravel roads and gravel pads along powerlines, will in all likelihood become new mega-seed sources, and spread into remaining ROW habitats, which are especially rich in biodiversity, including rare Lespedeza bush clovers, shrubland birds, Eastern box turtles, and the New England cottontail, our only rare rabbit species. Although mugwort seeds are known to remain viable for several years, protracted sprouting from the seed bank may not be an issue, after a nearby seed source is controlled, according to Kathleen Nelson. She is the tireless CIPWG volunteer scientist, who has been leading successful efforts to slow down the advance of Mile-a-Minute vine in Connecticut. She made a welcome discovery: mugwort seedlings entirely stopped sprouting on her land, the first year after a large, neighboring mugwort stand was mowed in early October of 2015 & 2016. The Connecticut Botanical Society suggests you call an official you know at your town hall, and explain why it is wise to control mugwort colonies; mention that prompt stabilization of bare soil will help eliminate seed beds for mugwort patches, as well as protect water quality. You could e-mail the link to this on-line article. The photo below shows mugwort and Japanese knotweed colonies on a former soil pile. Eversource officials and/or the CT Siting Council also need to understand that even thick gravel pads are readily colonized by mugwort, and become a significant seed source, statewide. This entry was posted in Botany, food chain, Invasive Species. Bookmark the permalink. This article is one of three prepared for a CBS press packet. Thanks for input from several friends (also plant scientists) from CIPWG, the CT Botanical Society and the Cheshire Land Trust. We really hope that towns and roadside property owners coordinate mugwort mowing in early to mid Sepember, so that the state is not subjected to yet another deluge of mugwort seeds. This formerly clonal species now, unfortunetely, has altogether viable seeds in Southern New England. This occurred some time in the last two decades. Perhaps fertility had been genetically suppressed by inbreeding depression during the past three and a half centuries, if most of the ballast transported by colonial sailing ships originated from just a few port-side mugwort clones in Europe. I am available. Thank you for bringing this article to the public’s attention. I am a Vegetation Management company, Beech Hill Vegetation, who specializes in mowing on slope, mounds, catch basins, reservoir dam faces, retention ponds and clearing land of invasive bushes, shrubs, weeds and trees. We are licensed and insured. Please give us a call we are available to be dispatched to helping eradicate the Mugwort.